Happy Friday everyone! I hope you have all had a great, stress free week. I am so so glad it's almost the weekend. But, luckily, I don't currently have work or grad school classes on Friday, so my weekend has technically already started. Don't get too jealous though, this is only short term and before I know it I'll be working 60 hours a week and only have Sunday off. But, until then, I am going to enjoy every minute of it. I am loving this top from Chicwish. I have had my eye on it for quite some time now but it wasn't until I saw it on another blogger that I finally decided to get it. Yes, we sometimes are inspired by our peers. I think sometimes, we as bloggers, don't like to admit that we sometimes get ideas from each other. But, to me, I am flattered when I inspire someone's outfit choices, etc. But anyways, enough of my rambling. This clutch was the perfect addition to my collection for the summer. I am always on the hunt to find a cute clutch, or handbag to be my staple for a particular season. 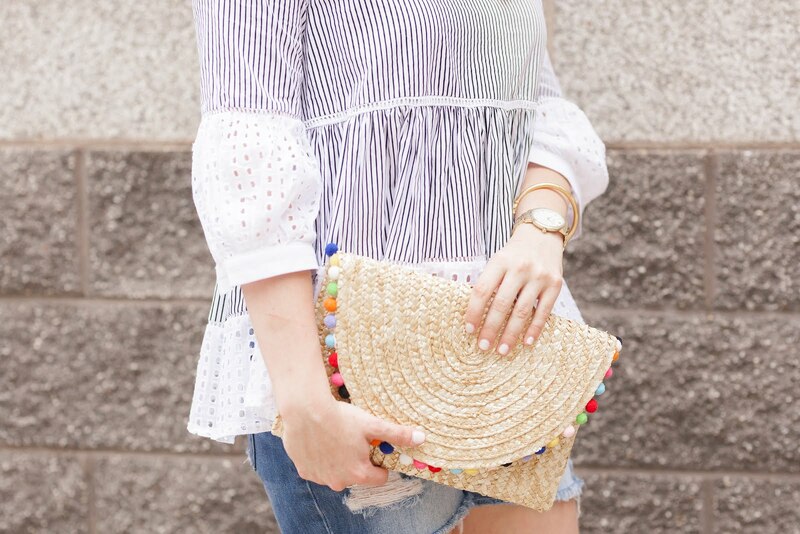 This clutch is definitely going to be getting a lot of use this summer. I already catch myself grabbing it to carry with almost everything. It's super cute, just big enough for the essentials and a great price point. Trust me when I say, you need to add this to your collection.